Unfortunately, it’s very easy to forget or put off having your eyes checked by a certified eye doctor. Many people think that as long as they’re seeing clearly and don’t notice any symptoms that may indicate vision problems, there’s no need to schedule a regular eye exam. This mentality is understandable, but it’s also problematic, as many eye conditions don’t produce symptoms in the early stages, making early detection impossible without an eye exam. In this blog, Downtown Eyes explains why eye exams are necessary and why you shouldn’t take them for granted. A vision screening is probably included in your annual physical checkup or as part of the process of getting or renewing your driver’s license. In this screening, you’re asked to read the letters on the Snellen chart aloud while each eye is covered alternately. It’s highly likely that you get a whopping 20-20 result in this screening every time, leading you to think that you have perfect vision. However, this assumption might not be correct. These vision screenings are also known as visual acuity tests, and they are also included as one component of a comprehensive eye examination. Visual acuity tests are performed to measure the sharpness of your vision. When you get a 20-20 result, it means that you can indeed see objects clearly and that your eyes are functioning acceptably. If you get a poor result, you’ll definitely be advised to see an eye doctor immediately. Vision screenings are great for determining how clearly you can see. However, they are just that. They are not meant to identify vision problems or eye diseases. While the result of a vision screening can suggest a refraction error, it cannot be used for diagnostic purposes and is not very helpful in identifying signs of more serious problems. Through a comprehensive eye exam performed by an ophthalmologist or optician in Minneapolis, possible issues with your eyes and vision will be identified, paving the way for effective treatment. Children who are about to start school should visit an eye doctor for a comprehensive exam. This is especially important for kids who have a history of myopia—or any other refraction error or eye disease. This is because at least 80 percent of what kids are expected to learn in and out of school requires good vision. Just think about it—a child who can’t see what’s written on the board may not be able to keep up with their peers, and that’s just one scenario. Many school-age children have vision problems that are left untreated simply because they haven’t seen a certified eye doctor. While your child’s pediatrician can check their eyes in general, the check often focuses on the physical structure or condition of the eye. The pediatrician will not be able to specify refraction or other underlying issues. When such issues are not controlled or treated, they can affect your child’s learning ability, behavior and adjustment in school. When you take your child to an annual eye exam, you can ensure that their vision is sharp and clear and that they can comfortably study and learn at school. Myopia (nearsightedness) is a common refraction error. It is the most common cause of vision problems among adults 40 and below. However, in the recent years, its prevalence has grown at an alarming rate. Over 40 percent of Americans currently have myopia, up from 25 percent in previous years. More and more children are being diagnosed with myopia, too. Nearsightedness is thought to run in families. Increased screen time among children has also been linked to the condition. Children who exhibits signs of myopia early in life may have difficulty living their life to the fullest, especially if the condition is not detected early and treated properly. 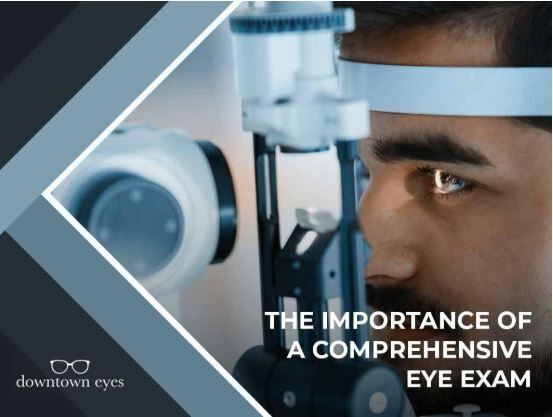 Whether you’re an adult or a child, it’s important to undergo regular comprehensive eye checks as this is the only way to determine your risk factors and if you already have the condition. If you are diagnosed with myopia, your eye doctor can recommend or prescribe necessary vision correction methods. Eye problems may also be linked to other health issues. For example, diabetes is actually the leading cause of blindness in the U.S. If you have undetected or uncontrolled diabetes and if you have constantly high sugar levels, you may experience blurred vision. You may also have difficulty seeing clearly at night, making driving quite dangerous. When you have your eyes checked and the doctor sees that there is nothing physically wrong with your eyes, then you may be referred to a specialist who can test you for diabetes. Furthermore, your eye condition may also reveal that you’re at risk of a stroke. Other conditions related to problematic vision include multiple sclerosis, high cholesterol and sleep apnea. Blurred vision is also one of the symptoms of migraines, lupus, psoriasis, Lyme disease and cat scratch fever. By undergoing a regular eye exam, you’re taking a proactive approach to not just your visual health, but your overall wellbeing too. An eye exam will help determine whether you need to be checked by another doctor who specializes in other health problems that you might have. When you have a vision problem, you may not see things around you as clearly as you should. For example, if you have a problem with your peripheral vision, you may be at a higher risk for falls. This is because your ability to see items or surfaces at your sides is reduced, so your brain is unable to process whether or not you need to be cautious of your surroundings. Furthermore, if you have an advanced refraction error or other eye diseases like glaucoma, driving may be especially risky for you. In fact, according to a 2012 study, people with glaucoma were twice as likely to be involved in a car accident as those who don’t have the condition. By having your eyes regularly checked by an eye doctor or optician in Minneapolis, your risk for eye diseases and vision problems will be properly assessed. Regular eye exams also help ensure that any existing vision problem you may have is treated and controlled, so that hopefully it will make little to no impact on your daily life. When administered by an experienced and certified eye doctor, an eye exam is an integral part of one’s healthcare. Downtown Eyes is home to friendly and certified eye doctors and opticians who can help safeguard your visual health. Do I Need Vision Insurance? Eyeglasses vs. Contact Lenses: Which to Choose? Fill out this form and we will contact you to finalize your appointment with us!